Unto my supplication’s voice give an attentive ear. 3 Lord, who shall stand, if thou, O Lord, should’st mark iniquity? 4 But yet with thee forgiveness is, that fear’d thou mayest be. 5 I wait for God, my soul doth wait, my hope is in his word. I say, more than they that do watch the morning light to see. And plenteous redemption is ever found with him. 8 And from all his iniquities he Isr’el shall redeem. In our family, we sing this psalm to the common meter tune Martyrdom. The thought that really “gets me” in this psalm is God’s great mercy to us, people who are full of iniquity. Though we by nature are children of wrath, like all mankind, He has provided for us the way of salvation. He has provided “plenteous redemption” to His people, through the Lord Jesus Christ. 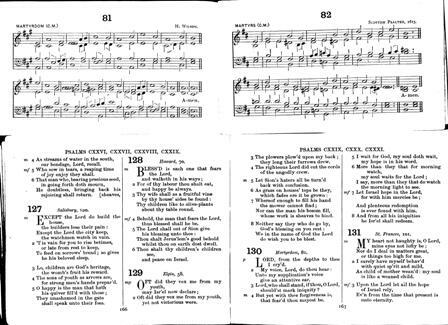 These pages are scanned from The Psalms in Metre, Scottish Metrical Version with tunes, supplement, and additional versions published for the Reformed Presbyterian Church of Ireland by Oxford University Press, London, 1979. This is a “split-leaf” psalter. The tunes are on the small top pages, and the metrical psalms are printed on the lower, larger pages. Since the psalms are arranged by musical meter (such as common meter, short meter, long meter, double common meter, double short meter, etc. – There are more!) you have a number of tunes available from which to choose when singing a psalm. In the back of the Psalter, there is also a listing of tunes arranged by categories, such as Plaintive, Prayerful, Restful, Didactic, Cheerful, Jubilant, etc. This way, as the mood of a psalm changes, you can select another, more appropriate tune. Also, if you are singing through a long psalm, you can change tunes to alleviate the monotony. One part of our family worship time involves singing a Psalm, using the metrical psalter. We find singing through God’s songbook in this way to be enjoyable, beneficial and edifying! This entry was posted on Sunday, September 2nd, 2007 at 1:25 pm	and is filed under Bible Thoughts, Sunday Thoughts. You can follow any responses to this entry through the RSS 2.0 feed. Both comments and pings are currently closed. thanks for your kind comments! what is your email address so that I can answer you back? i’m thetallamy@hotmail.com! great blog! I am taking the personality profile thing right now to see if I am still a ESFJ or whatever…. ha! I havent taught my own kids the Psalms in music but I learned lots of them set to music as a child. They sure stick with you that way!